Thousands of years before yoga and meditation became popular in the Yoga Centres and Yoga Studios of West, ‘Yoga’ was already a way of life in the ancient nation of India. Mention in the Rig Veda is some of the earliest references to yoga, asanas, pranayama, and meditation that are found in the ancient scriptures in India and Nepal. For some decades, the benefits of yoga have made a worldwide trend. Thus, with the rise in popularity of yoga in the US and other Western countries, serious seekers of yogis and spiritual travelers are increasingly making their way to the land of its birth. Meanwhile, in India, Yoga Centres, Yoga Ashrams and Yoga Retreats have grown just as mushrooms across the country. Hence, for those who are in search of the best yoga centers here is a list to help you what find the one that would best suit you. Renowned worldwide for Sudarshan Kriya (a rhythmic breathing technique), other stress-elimination and self-development programs based mainly on pranayama, meditation, and yoga. The Art of Living International Ashram is one of the best Ashrams not only in India but in the world. Founded by H.H. Sri Sri Ravi Shankar in 1982, it is a volunteer-based organization that also undertakes various initiatives aimed at uplifting humanity and enhancing the quality of life. For Beginners Level, Sri Sri Yoga is the basic yoga program offered by the institution usually for 5 days. The program combines yoga essentials: breathing techniques, stretching, yoga postures, meditation, relaxation, simple and relevant knowledge from the ancient text of Patanjali Yoga Sutras, a glimpse of Ayurveda and our unique body composition. By incorporating all these beautiful facets of yoga, we are able to look beyond the level of the physical body and really sharpen our sensitivity and awareness of subtler levels of existence. The practice of Sri Sri Yoga cultivates a healthier and happier lifestyle. For Advance Level, there is Sri Sri Yoga Level 2. This program is for those who want to experience yoga in depth. Here, you will experience the complete cleansing of the entire system – both the mind and body, so that you feel light and fresh to make a new start. Advanced yoga poses and breathing techniques, along with Subtle Strengthening and Healing Contractions (SSaHC) is the prime highlight of the program. A four-day vacation in a serene retreat setting, you will look forward to keep coming back to yourself more often. The Isha Foundation is an organization founded by Sadhguru to create an inclusive culture towards global harmony and progress. This organization not only run the yoga center but also works on literacy, rural sustenance and for environment conservation. Its powerful yoga programs for inner transformation and inspiring projects for society and the environment are appreciated worldwide, reflected in Isha’s consultative status with the United Nations Economic and Social Council. 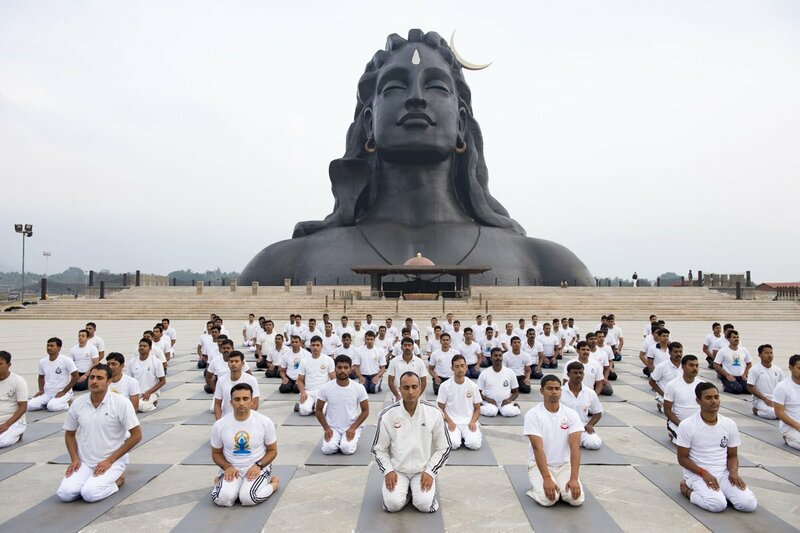 Isha Foundation is an essential center of resources for those who wish to explore the ancient science of yoga in all its depth and dimensions. Offering a variety of programs that provide methods for anyone to attain physical, mental, and spiritual wellbeing, it aims to enable people to deepen their experience of life, and reach their ultimate potential. In the Bihar School of yoga, yoga is not just a practice but is a lifestyle, and karma yoga is the one given precedence over asana. Set in the midst of a 14th-century fort, the campus of the Bihar School of Yoga spells history. Founded in 1964 by Sri Swami Satyananda Saraswati, this school of Yoga integrates several approaches to personal development, based on tantric and yogic teaching. The school is situated on a hill overlooking river Ganga in Munger, Bihar. The Yoga ashram, which the school is a part of, is called Ganga Darshan Yogashram, which is a spiritual retreat for aspirants. The ashram follows the modern day gurukul lifestyle and the schools offer yogic teachings for regular students as well as people who have totally devoted their life to spirituality. The yoga practiced in Bihar School of Yoga is Satyananda Yoga, which is also popularly known as Bihar Yoga. Apart from teaching, this center also guides yoga projects and medical research in association with various corporations and state government. Rishikesh is also known as the “City of the Divine”- it is a spiritual center to which sages, rishis, saints, and pilgrims have flocked for millennia. Likely, one of the most popular Yoga Centers in India, Parmarth Niketan Ashram is situated in the holy town of Rishikesh. ‘Parmarth’ which means divine, is the most suitable wonderful spiritual place to study yoga. It is the largest ashram in Rishikesh, providing its thousands of pilgrims who come from all corners of the Earth with a clean, pure and sacred atmosphere as well as abundant and beautiful gardens. With more than 1000 rooms in the center, the ashram runs innumerable programs, conducted by guest faculties, on yin yoga, vinyasa yoga, kriya & meditation yoga along with routine yoga retreat throughout the year. Parmarth Niketan Ashram also conducts regular teacher training course, and study related to Vedic heritage and spirituality. Day to day classes is also available for the visitors. The daily activities at Parmarth Niketan include morning universal prayers, daily yoga and meditation classes, daily Satsangs (divine musicals), lecture programs, kirtan and the world-renowned Ganga Aarti at sunset, as well as offering Nature Cure and Ayurvedic treatment services. They also host the world famous yoga festival in the month of March, every year. This institute in Mysore, a city of palaces and fountains near Bangalore, is much sought-after by yogis, who are very serious about yoga from all over the world. Handled by the decedents of the revered Guru, Sri Krishna Pattabhi Jois, this popular Yoga center offers intensive Ashtanga yoga classes throughout the year. Sri Krishna Pattabhi Jois, who taught yoga there from the 1930s up until his death in 2009. The institute was established by Sri K. Pattabhi Jois, in 1948. He was the disciple of famous yoga exponent T Krishnamacharya. Jois propagated the ashtanga vinyasa brand of yoga, which is the fast-paced synchronization of breath and movement throughout the routine. The courses range from one month to six months. Students can also take classes in Sanskrit, in which the ancient yogic texts are written. The much-sought-after classes offered are for serious students only. Therefore, it is necessary to apply at least two months in advance to book your place. Although, an accommodation isn’t provided in the premise, there are plenty of places to stay available nearby. A must-visit place for any serious yoga practitioner, the institute attracts students of yoga from all over the world. This Yoga Centre conducts classes in ‘Iyengar Yoga’, a form of Hatha Yoga which focuses on postures with breath control. There are special classes for women, children, and people with medical conditions. Better known as B.K.S. Iyengar, Iyengar was one of the earliest students of Tirumalai Krishnamacharya, who is often referred to as “The Father of Modern Yoga”. The Iyengar school emphasizes the in-depth study of asanas (anatomically correct postures) and pranayama (breathing). It teaches students to adapt and modify their exercise routine depending on the environment. As the Institute emphasizes the in-depth study of yoga, students are also required to have substantial prior experience in practicing Iyengar Yoga. So before packing your Yoga Mat and heading for India, learn the basics from a certified Iyengar teacher in your country. Unfortunately, there can be a two-year wait to get a place at the Institute. One of the best yoga and famous centers in India, Krishnamacharya Yoga Mandiram was founded by the son of the ‘Father of Modern Yoga’ – T. Krishnamacharya. Krishnamacharya taught yoga to both BKS Iyengar and Sri K. Pattabhi Jois. He developed an individualized style of yoga known as ‘Viniyoga’, based on Hatha Yoga adapted to suit different needs. Their programs cover principles, teachings, the practice of asanas, pranayama, meditation, mantra and key aspects of yoga philosophy. Here, in the heart of Yoga practice is one of the institute’s most popular programs. It’s a 120 hour, four-week non-residential intensive program covering the key aspects of asana, pranayama, philosophy, meditation, and chanting. Vedic chanting and pranayama (breathing), along with a special 500 hour+ International Teacher Training Program. Alongside yoga therapy sessions, Yoga Mandiram conducts various international yoga teachers training programmes with international healing chants teachers training programme aswell. Sivananda Yoga Vedanta Centres is a non-profit organization named after Swami Sivananda, one of the most influential spiritual teacher of the 20th century the institute is founded by his disciple Swami Vishnudevananda. 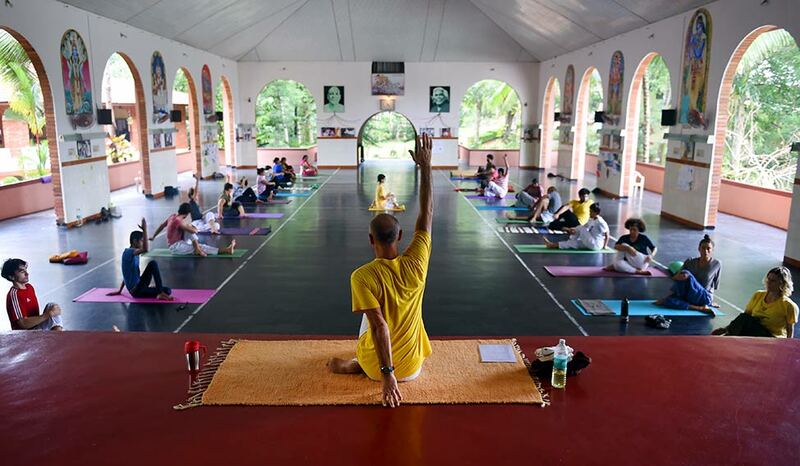 The Sivananda Yoga Vedanta Ashrams and Centres are recognized worldwide for teaching yoga authentically, preserving its purity and tradition dating back several thousand years. They also offer a wide variety of teachings at the Sivananda Ashram that is based around five points of yoga; Proper Exercise (Asanas), Proper Breathing (Pranayama), Proper Relaxation (Savasana), Proper Diet (vegetarian), Positive Thinking (Vedanta) and Meditation (Dhyana). Showing specific ways to develop physical and mental health as well as spiritual growth. The ashram offers drop-in classes, as well as courses in yoga and meditation. The beginner’s yoga and meditation courses are very popular and Yoga Vacations and Teacher Training, staying at the ashram, are also offered. Being a century old, the Yoga Institute is known to be the oldest organized center of yoga in the world. Founded by Shri Yogendraji in 1918, the Institute, while not being as well known as some of India’s other yoga centers, it offers a range of excellent courses, workshops, and camps. The therapeutic health camps are of particular interest which aims to overcome specific ailments including heart and respiratory problems, hypertension, diabetes, orthopedic conditions, and stress-related issues. There are also special programs for children and pregnant women. The institute is a government recognized non-profit organization, also certified by The Ministry of AYUSH, Government of India as the first authorized Yoga School to conduct government certified courses. It won the Prime Minister’s Award 2018 by Ministry of AYUSH for outstanding contribution in the field of Yoga in June 2018.